Smoking pipes is really all about relaxation. Since tobacco was discovered its been a favorite pastime of men and now some women find themselves smoking a tobacco pipe. The tobacco pipe is the only option which gives the smoker a lasting sense of pleasure and a total state of relaxation. A pipe is truly is a thing of beauty. Some even call a well-crafted pipe a work of art. It’s a pleasure to hold, inspect, perhaps tell a story about, and demands a certain amount of respect. What you’ll find over time is that smoking a pipe is actually an art and a science. The first task to learn is packing your pipe. Once it is packed with your pipe tobacco of choice, lighting it evenly is the next challenge. Learning to actually smoke your pipe will also take some time. Don’t be afraid though, learning these skills is not a painstakingly long process nor are they hard to learn. It just takes some understanding and patience. The rewards of properly smoked tobacco pipes is a wonderful aroma and a great taste, not to mention a relaxed state of mind. When choosing a pipe, take some time to consider it as you would when purchasing an accessory like a watch. Think about how you will look with it in your mouth. Pick it up, handle it, and compare it to others. Take your time! Remember, if treated properly, your pipe will become a lifelong companion helping you enjoy hours of relaxation. 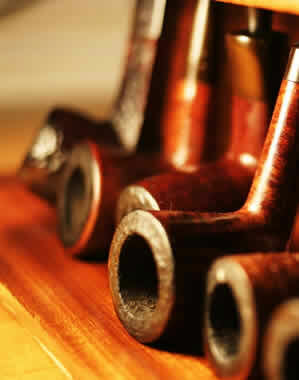 The mark of a great pipe maker is to follow the natural grain of the briar to shape his creation. Because briar is a natural resource, influenced by factors such as climate and soil, the quality of its grain varies greatly. A few pipes will have perfect, uniform grain patterns and fetch big prices. 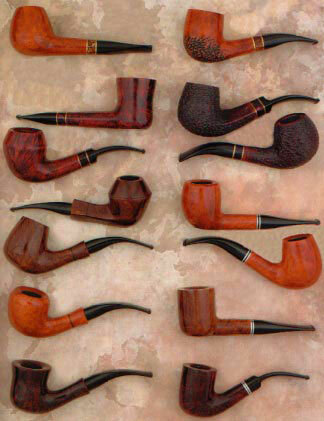 Pipes are available in an almost limitless variety of shapes. There are more than 100 standard shapes and there are also freehand shapes when the pipe maker allows the briar’s grain dictate the shape of the pipe. Choosing the appropriate tobacco is an important part of pipe smoking. 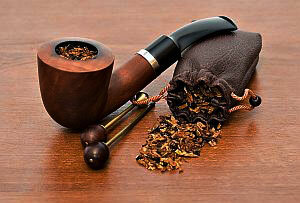 There are basically three different types of pipe tobacco—aromatic blends, Virginia blends and English blends. These tobaccos exhibit their own characteristics but generally the aromatics are flavored, Virginia blends tend to be sweet and English blends are typically stronger. Take time to reflect on your mood and choose wisely. Consider the blend by reading the information on the container. What types of tobacco have gone into the blend? Some blends are so complex that they incorporate tobaccos grown on as many as three, sometimes four continents. Look at the blend. How is it cut? Blenders pay close attention to how the different tobaccos will look in the tin. How does the dark leaf look next to a bright yellow strand of Virginia tobacco? Bring the tin up to your nose and take a deep sniff. What do you think of when you first sniff the aroma? Is it light and fruity or is it pungent? Pipe smoking is as much as a ritual as it is enjoyment and the smart pipe smoker will take time to study the blends that he smokes. Remember, tobacco blending is an art and the tobacco blender is an artist who must account for his its appearance, aroma and taste. Smoking a pipe should garner your respect and attention and it can be a vehicle for thoughtful contemplation. 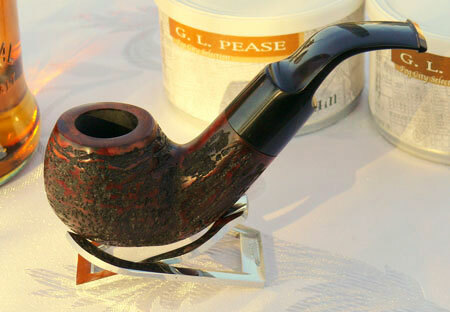 A very popular pipe smoking tobacco is Captain Black Pipe Tobacco. 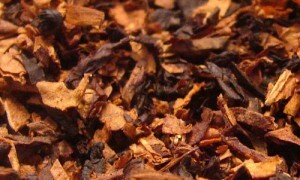 It features rich blends of Cavendish, Burleys, and other fine tobaccos. Step 1. Fill the bowl to the top and then press down on the tobacco lightly, as a child would. Step 2. Fill the bowl again and press down on the tobacco more firmly, as a mother might. Step 3. Then fill the bowl once again to the top and then press down on the tobacco very hard, as the father might do. Like loading your pipe? You should light your pipe in three stages. The first two lights, called “charring lights” or “false lights,” play an important role in how well your tobacco will burn and stay lit on your third light. Use either a match or a butane lighter but do not use a torch lighter because it will scorch your bowl and rim quite quickly and ruin your pipe. If you are using a match, let the sulfur burn off the match tip before lighting to prevent a sulfuric taste. It all comes down to personal preference as there are arguments both for and against using matches or lighters. Step 1. Take your match or pipe lighter (Zippo makes a good one) and pass it very slowly and evenly over the top of the tobacco while puffing on your pipe. Once the top layer of tobacco is charred and has risen to the top of the bowl, stop and let the smoldering tobacco go out, then take your pipe tamper and tamp down the tobacco that has charred and risen. Step 2. Repeat this process one more time until there is a layer of charred tobacco completely covering the top of the bowl. Step 3. You are now ready for the third, and hopefully final, light. Slowly pass your match or lighter in a circular motion across the entire surface of the tobacco while gently puffing on your pipe. Once all of the tobacco on the top layer is again burning, set your match or lighter down, keep your tamper handy, sit back, relax and enjoy your pipe. Part Alignment: A quality pipe will have a precision airway from the stem to the draft hole which is located in the bowl. Any disruption in the airway will cause turbulence in the smoke stream and will cause the pipe to smoke wet and probably loudly. Occasionally pipes are designed with a moisture trap that does work very well. It really is a matter of preference but is not recommended for the beginner. Fills: When a crack, large hole, or pit is found by the pipe maker it is filled in with putty. These don’t necessarily interfere with the quality of smoke, but rather effect the pipe aesthetically. 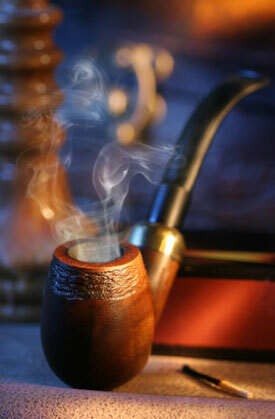 The putty will note age as gracefully as the rest of the briar and could cause a mottled appearance of the pipe. One last thing to note is that you might not be able to tell just how deep a fill actually is. Filters: A metal insert in the stem of the pipe can can cause condensation which will again result in a noisy, wet smoke. Finishes: Try to avoid varnished or sealed finishes. These finishes can crack or bubble over time, so it’s best to steer clear. Grain: High quality pipes will have a uniform tight grain however this will have no impact on smoking quality. Weight: Try to find a pipe that appears lighter than it should. It really comes down to how comfortable the pipe is to smoke. Draft Hole: Ideally the draft hole should terminate in the center of the bowl. Steer clear from a pipe where the draft hole is halfway up the bowl.